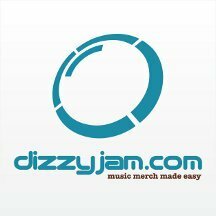 Dizzyjam are a print-on-demand merchandise service for the music industry. We aim to provide a risk free service, with no cost to our sellers - no finding money up front and no leftover XXL t-shirts. Anyone who plays, makes or promotes music can create a shop for free and upload an image to create their products. All that's left is to direct their fans to their shop and collect 25% of the money on everything they sell. We are passionate about helping people make a living from their music and who believe strongly in musicians having a recognisable image, Dizzyjam will support projects related to music and music merchandise, as well as music related design. As a company that values creativity, innovation and integrity, Dizzyjam aims to help projects on Kisskissbankbank related to the music, music technology and design industries. By promoting the projects we support via our website, newsletter and social media pages we will expose them to a wider audience and draw attention to their creative efforts. We also offer to mentor those running projects in marketing themselves, including helping them to create a recognisable branded image and helping them to make money through merchandise, if they wish.